The Weathering the Storms webinar series was just a beginning, a way to present what we feel is some of the most essential information regarding how to prevent, prepare for, and respond to possible attacks. For many of you, this overview may be enough – a good reminder, a “jolt” to pay more attention or review things you already have in place, an affirmation of your current readiness practice and a way of learning about other resources to draw upon. For others, the information may come as a surprise, a bit of a shock and a realization of how unprepared you are, and an impetus to delay no longer. To learn more about kinds of attacks social groups have been facing, read the following memo and considering sharing it with your allies and bringing up the topic in coalitions your participate in. We need to share and support each other to learn from and be better prepared to counter these attacks. There are many pieces to put in place on the readiness and response side and you may want to go deeper in certain areas, understand more precisely what it takes, interact more with you peers who may be at a similar level of vulnerability or readiness, or get assistance from an organizational, legal and communications expert to guide your implementation, to review your plans, to be available to you in case of emergency. Check back periodically, as we will continue to update the toolkit and this list of resources as additional information comes to our attention. 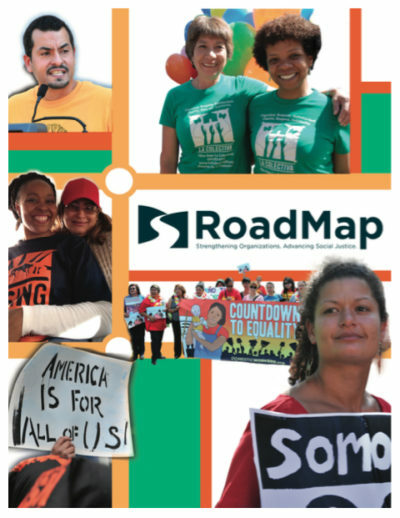 Please send your favorite go-to resources to margi@roadmapconsulting.org, and we will add them to the site! Start by downloading and reviewing our Toolkit, which combines sample policies with additional information crucial to organizational readiness. Don’t miss the comprehensive checklist that walks you through the steps to getting and keeping your house in order. To download the PDF to your computer, follow the link below. Disclaimer: The content of the webinars and this toolkit is solely the responsibility of Roadmap and the experts who have guided us throughout. The sample policies and recommendations should not be considered as legal advice, and we encourage consultation of competent professionals before adopting any template documents. Note about sharing these Tools: During the webinar, several of you asked whether you could share the materials with your organizational allies, members of alliances, and others. Our answer is yes, but with discretion! The goal of this project is to get the information out to as many people as possible. And while RoadMap’s practice always is to share far and wide, in this case, due to security concerns, we and the funders have decided to manage access through registration on this password protected site. Please do not share the password we provide. The temporary password will expire after 60 days. Ask your allies to contact us so we can set them up with their own account. And please use your discretion and judgment in sharing particular tools or templates. We have compiled links for many of the Must Read Resources listed in Section 4 of our Toolkit for convenient downloading below. Many thanks to the authors of these indispensable resources: Harmon, Curran, Spielberg + Eisenberg, Guidestar, National Council on Nonprofits, Nonprofit Coordinating Committee, Alliance for Justice, and Political Research Associates.